One of major sport tournaments UEFA Euro 2012 is happening now in Europe and in couple hours first semi final will start between Portugal and Spain. It will be interesting match and it is very hard to predict who will win. I want to share one picture. It is 6 years old photo. 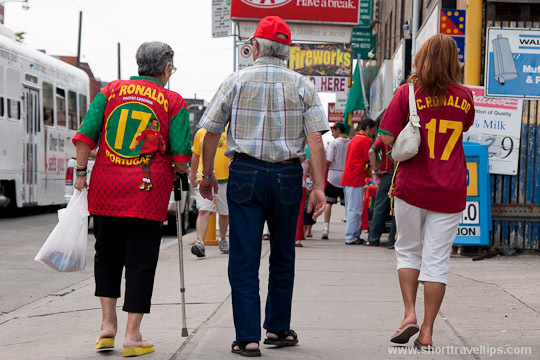 At the time I was in Toronto, Canada and was visiting different communities (Italian, Portuguese, Greece) which are crazy about football and was taking pictures of the people on the streets. I think it easy to guess in which town area was taken this shot 🙂 Lets see what Ronaldo will show as today. Enjoy the game. Lauren, where about in Canada did you live? I watched final of World Cup 2006 at Rogers centre in Toronto and the stadium was full of people watching game on huge screen. Toronto always feels alive when there’s a big overseas soccer tournament. I think of all the honking cars and the flags waving when someone’s home country wins. Samuel, I think in Korea it is quite popular sport. Great shot! I love the excitement of watching the games! It not surprising that Canada was a buzz over the Euro 2012 as it has become the melting pot of many nationalities from all across the globe. So congratulation to all Spanish decedents on Spain’s great win! Ronaldo is a superstar and easily one of the top 5 players in the world, so it’s no wonder he has a strong fanbase.